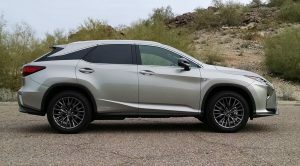 Since the Lexus RX450h was completely redesigned for the 2016 model year, it has also become available in the sportier F Sport trim grade with a host of upgrades that make it handle better, feel better, and look better. 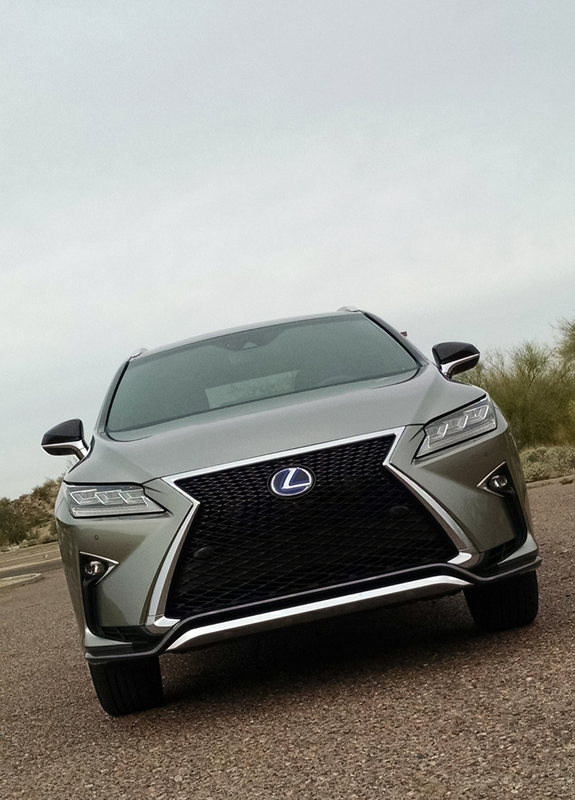 Styling changes start right up front with the F Sport grille, entirely different from the standard RX450h face. It has the double mesh design, deeply sculpted fog light recesses and a more aggressive lower valance. Headlights on ours were the optional LED which ring in at $1615. They have an L shaped daytime running light flanked by a triple LED lamp set that form little L shaped lights. Wheels are larger 20-inch alloys with a dark metallic finish and really fill the wheel arches out well. 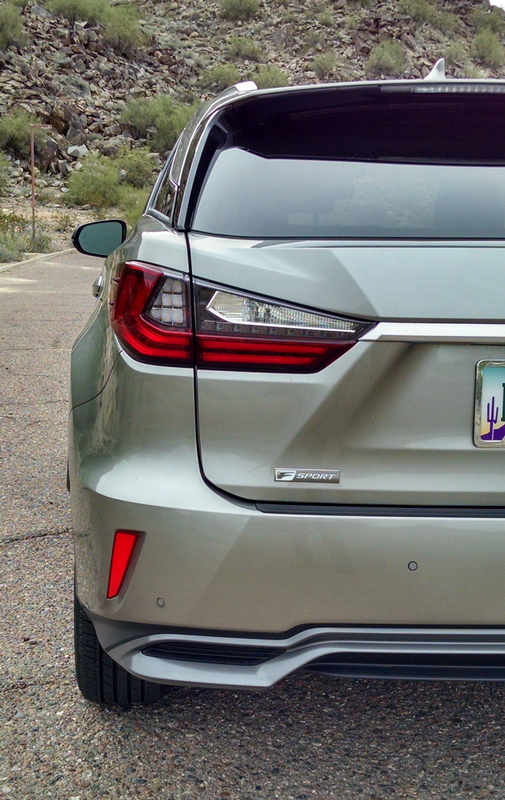 The RX also features LED rear tail lights that mimic the L shaped themes from the front. They book end the floating roof design well that features a glass wrap around effect. 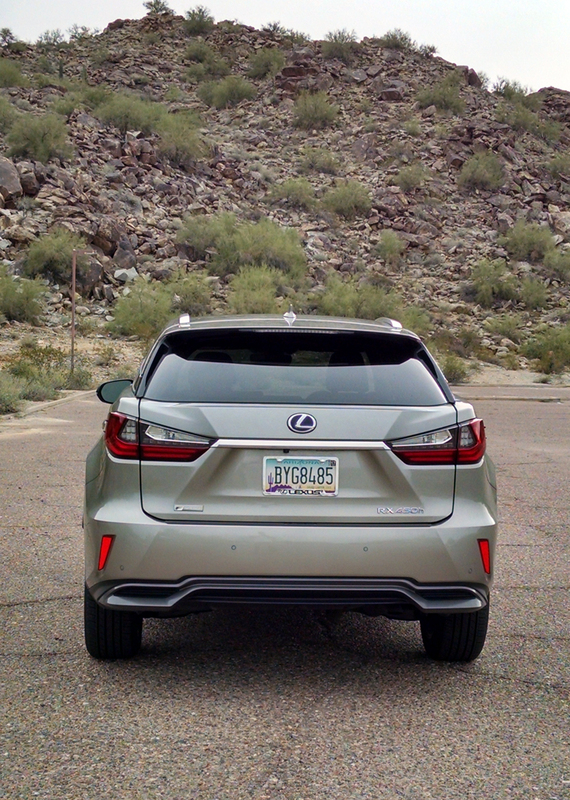 The lower fascia like the base RX450h is designed to hide the exhaust tips for a clean image instead of highlight them for performance cred. 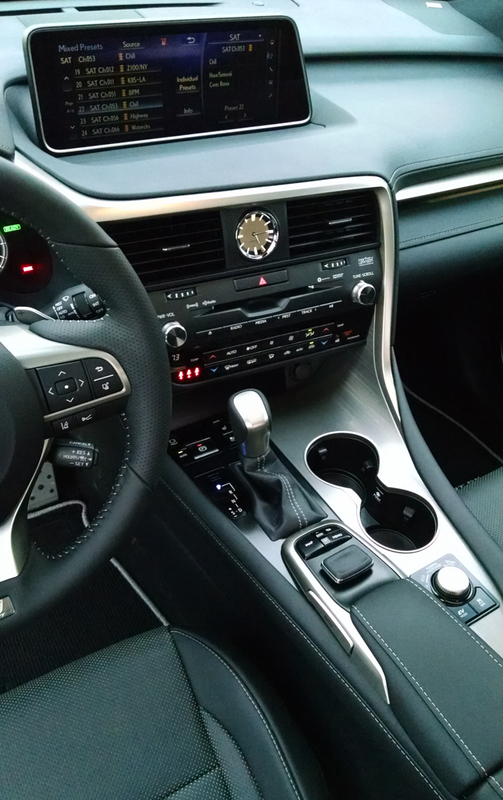 Inside, the F Sport trim brings special leather seating with perforated material, heated and ventilated, and with generous side bolstering. Power adjustable on both sides, they are exceptionally comfortable and offer good adjustment range. 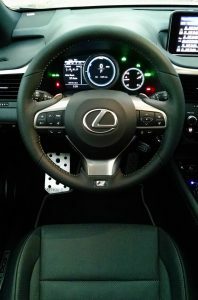 An F Sport steering wheel features paddle shifters and a unique instrument cluster is more akin to the ones found in Lexus sport sedans. Trims here are patterned aluminum instead of woods, a more sporting theme. 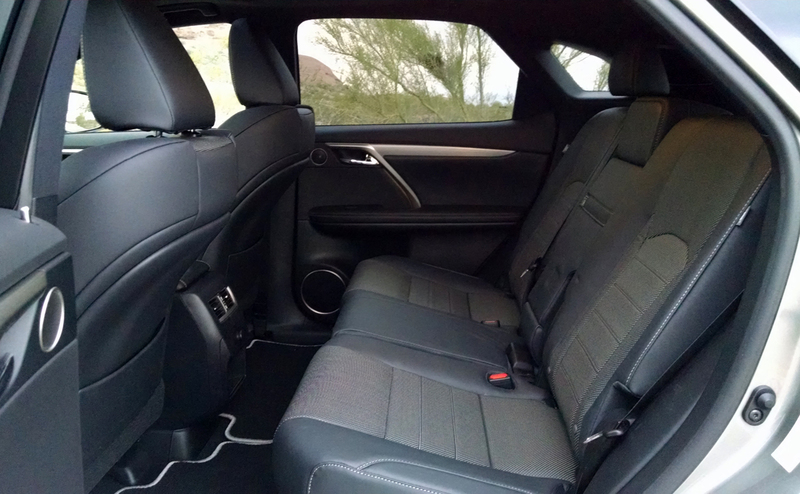 rear seat passengers will enjoy plenty of space with an adjustable lower cushion and seat back rake. 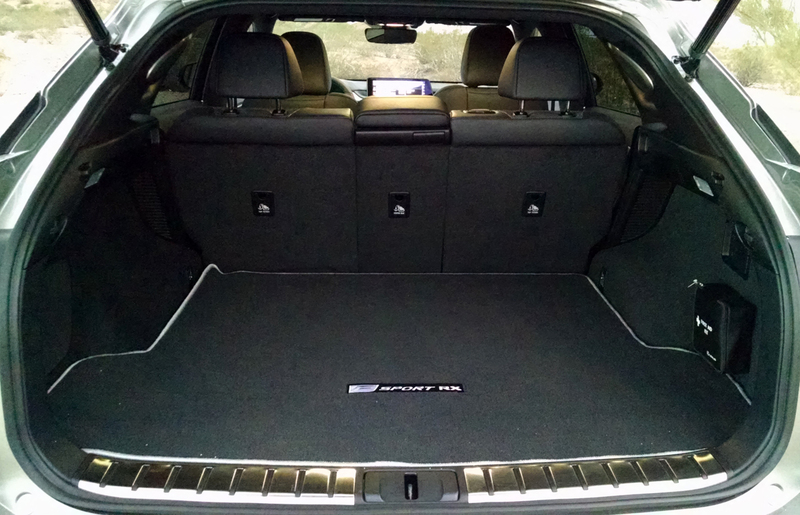 The seats fold in a 40/20/40 split and make for a near flat cargo floor that’s barely affected by the large hybrid batter pack. 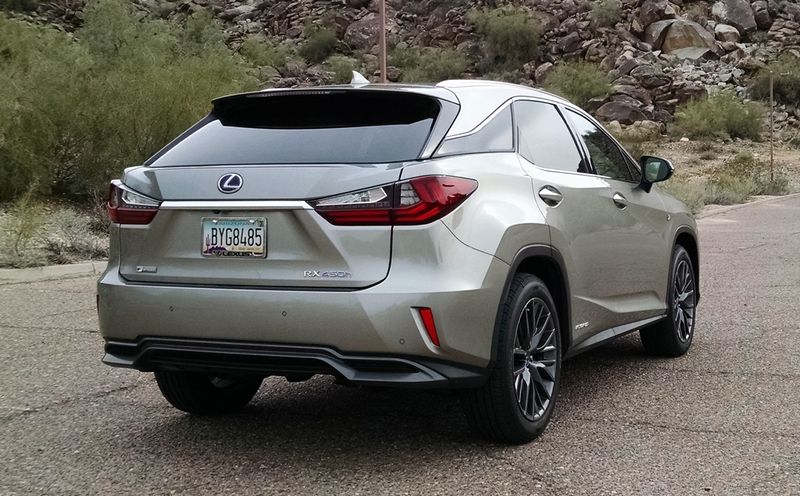 Powering the RX450h is a 3.5 liter V6 mated to a hybrid continuously variable transmission with two electric motors built-in. 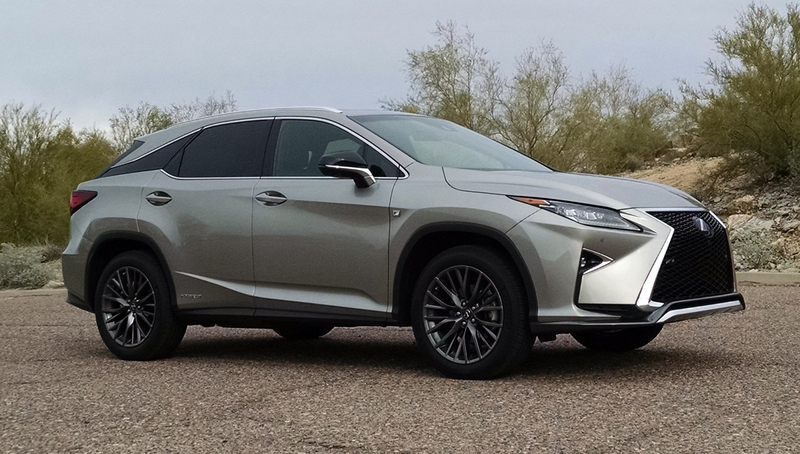 The system can power the RX450h under electric power only pretty robustly, on gasoline power or both sources for a total 308 combined horsepower – the most powerful RX you can buy. 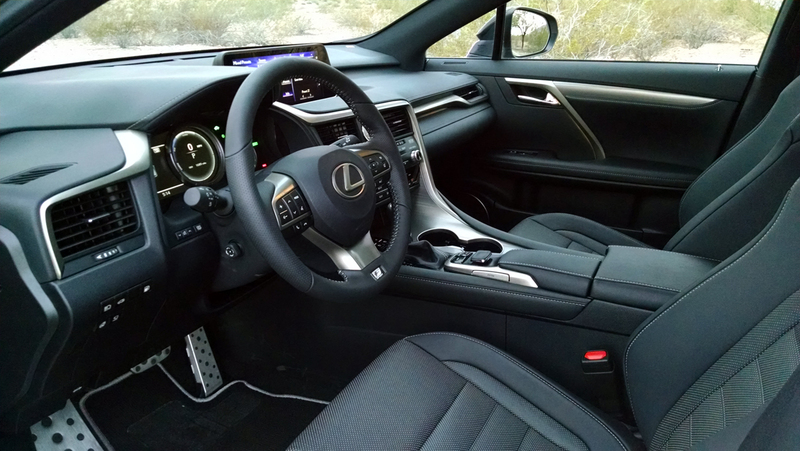 Power is progressive and more than adequate, but in the F Sport guise with its sporting intentions and paddle shifters the transmission behavior falls somewhat short. Using the paddles for their simulated shift points offers up a delayed slip and slide that is hardly worth your efforts. In the end fuel economy is the goal with the hybrid. 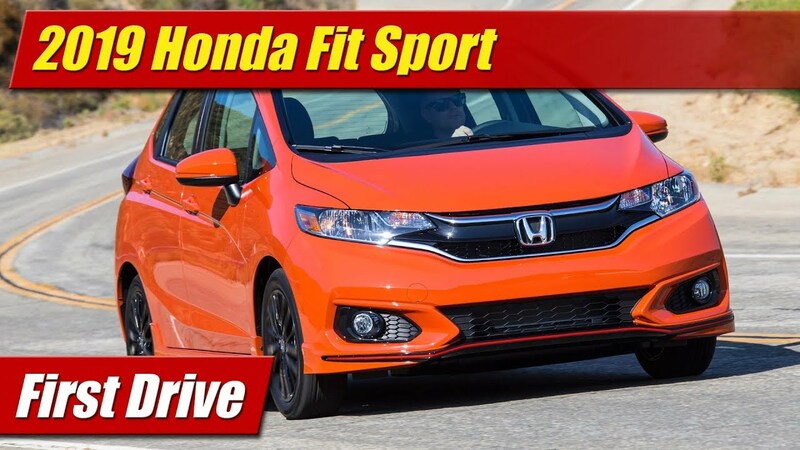 It’s rated by the EPA at 31 mpg city, 28 mpg highway and 30 mpg combined. In our week with it we achieved 27 mpg, not quite what was promised. 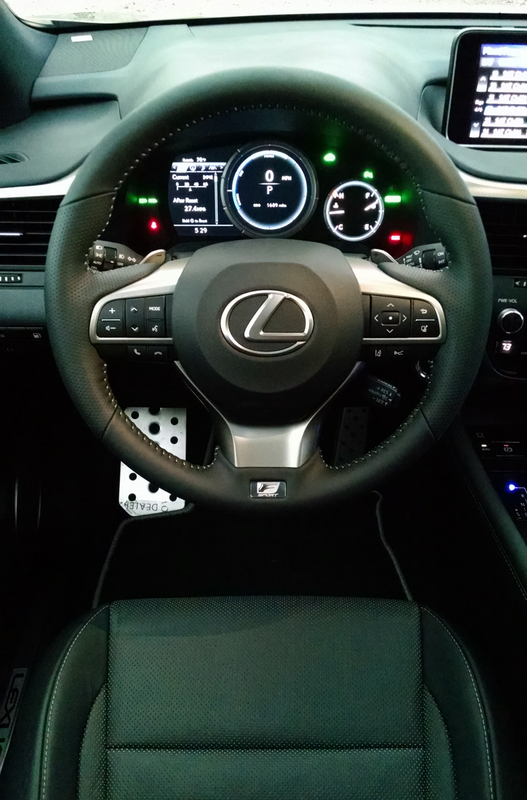 Handling however does promise and deliver on its F Sport feel. 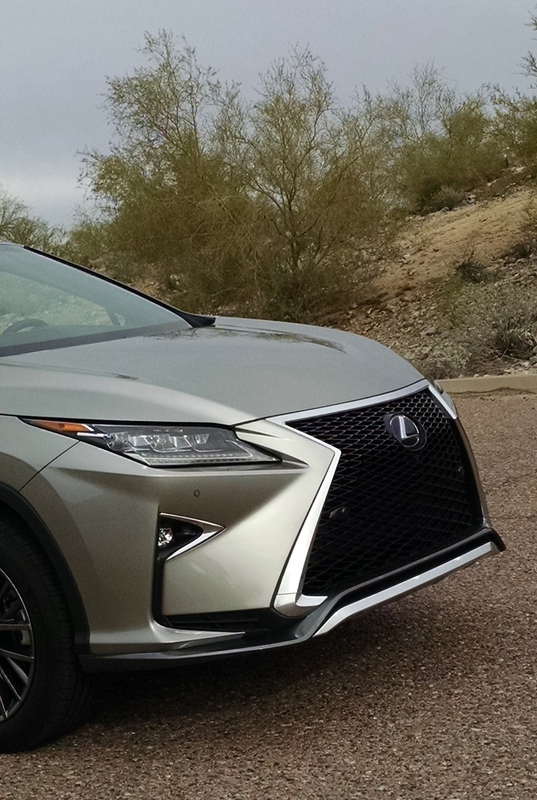 A stiffer and more aggressive tune gives the RX450h a sharp turn in on windy roads. Even though it weighs close to 4,800 pounds, it manages to be easy to toss around. The ride is quiet and supple most of the time but because of its large 20-inch wheels and low profile tires it can sometimes be harsh when the pavement gets less than smooth. Priced at $61,804, the Lexus RX450h doesn’t come cheap. Priced about mid level from low to high for the model it did however come with a nice level of amenities for the money. 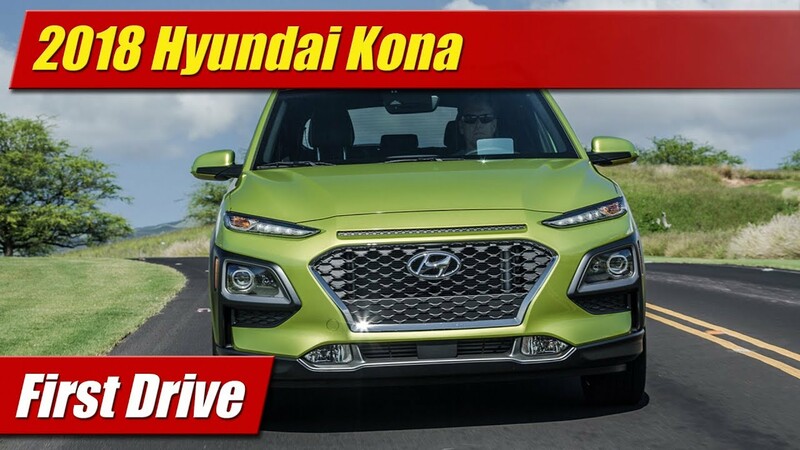 The question becomes is the uptick for the hybrid worth the fuel economy and loss of a more traditional driving character associated with the RX350.